There are probably few jobs for organizing a prom than hiring a DJ. After all, it can't be just any old DJ. They have to be somebody who is fun, somebody who has a personality to match the event, somebody who has a playlist that won't limit your choices, and perhaps most important of all, somebody who can work within your budget. That's a lot of requirements, to be sure, but when it comes to most experienced DJs, they're hardly unfamiliar to them. Most good DJs work with these issues all the time. The trouble is that most DJs won't budge a lot when it comes to stretching what they offer to what you want. Elkhart DJ is different. 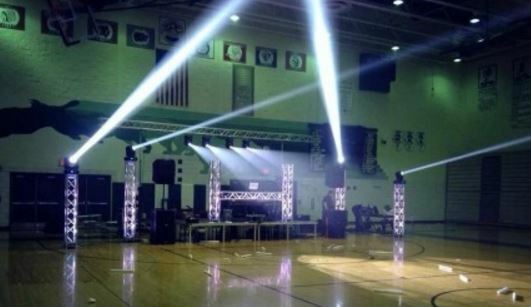 With Elkhart DJ we understand that the winter dance you are putting on is your winter dance, your event, and we will do everything we can to make sure it stays that way. We do this by working closely with whomever your organizers are to create an environment where the last thing you have to worry about is the music. And the only nod to our DJs who work your event is "Wow." That's right. We provide a DJ for graduation pricing, but just as important as being able to afford what you get is the DJ prom song list, whether you want it to be classic, only the newest, or a combination of the two. It's your graduation, and we understand that you call the shots for what you want. With Elkhart DJ we will tailor our song lists to your needs, not the other way around. But hiring a DJ for an event such as a prom, winter dance, or graduations is more than just playlists, it's about personality. It's about the personality of your event and how we can fit the type of DJ and his work to fit your needs. What is the flavor of your graduation? Is it classic? Is it hip-hop? We want to not only fit the music but to make the DJ fit your event. Want somebody who is mellow to set a quieter mood? Or would you like a DJ that is an event in and of himself? We can do it for you. Regardless of where you are in the planning for your prom, we want to talk to you about your needs. Don't wait until the last minute. Call Elkhart DJ now so we will be able to make your music needs a part of your "Done" list. Give the music that is played at your prom the treatment it deserves. After all, it's a big part of what your guests will remember long after the music stops. Elkhart DJ has special prices for hire a DJ cost, so we know how to work effectively with planners. Let us make your prom one of the best you have ever had. That's our goal, and it should be for you too. Call Elkhart DJ today for more complete information about specials on proms and other memorable events. We promise an evening you and the rest of your guests will never forget.